A decent anime with a rather generic storyline about a misunderstood guy who does not have any friends, which meets a classmate in a similar situation and they decide to form a club to find more friends. That is how “Rinjinbu”, The Neigbours’ Club, was formed, a club specifically designed for people who don’t have very many friends. As other lonely classmates slowly join their little club, they’ll try to learn how to build friendships through cooking together, playing games, and other group activities. But will this group of relationship-challenged misfits really be able to get along? With a rather generic storyline you would think that this anime is totally not worth watching, however the occasional funny scenes as well as some interesting rivalry between members makes up for the anime. However, in the end, it can be said as a temporary time waster anime for those fans who are seriously into romantic or comedic genres. This anime can be said of more slice of life with a mixture of dry comedy and interesting characters. By no means will this anime want to make you rewatch it for a second time. I have to admit that the art did take some time to get used to. For the first episode, I somehow kept staring at the character's noses as if there was something missing or tweaked. Then as I watched, I got familiar with this art style. Its unrealistic to an extent, but not too unrealistic to make this anime into a fantasy/sci-fi film. The background scenery was decently illustrated with some nice lighting and visual effects. Ok so its been a while since I've watched this anime and I don't quite remember any of the opening or closing theme songs. This just definitely proves that the music overall didn't affect me much now. I may have overlooked some dramatic scenes that featured appropriate music, but I'm making a huge guess here. The voice acting was decent, the voice actors weren't so memorable. Overall, I would say that sound quality was average. The characters were definitely memorable from their looks. The main protagonist with his bright yellow hair is hard to forget even after watching this anime a few months ago. In the end, I loved the many costume changes and the interesting relationships that form or break throughout the anime. 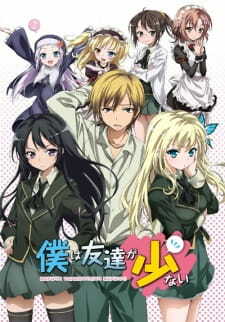 Overall, this anime does have some unrealistic funny elements but may not be enough to compensate to the overall story. One suggestion I would like to make is that if you have limitless time in the world, this anime may be worth watching to take off those extra boredom hours of your life. Other than that, it's a decent anime for slice of life fans to watch. Not much of a story here. Just some funny scenes and a couple of rivalry scenes thrown in. By no means should you watch this anime just because of the story. Took some time to get used to, but eventually I did. I still can't stop staring at the faces as if there's something wrong. Otherwise, the scenery is good. I certainly did not remember any of the opening or closing songs. The voice characters were average. In the end, it did not really matter. There were some cute and interesting characters with varied personalities throughout the anime. I was slightly annoyed at some hair colour choices though. Its funny in some bit and boring in others. The everyday life of a lonely guy can be interesting or downright boring depending on what type of person you are. Not bad but not excellent. If the story was improved dramatically and the characters portrayed better, this would have been a better anime.